AM – 50-minute flight from Lima – Arequipa; upon arrival, you will be transferred to your selected hotel – then, you will have free time on your own account to become accustomed to the altitude until the hour of our city tour. 14:00 PM – We will personally pick you up from your hotel in Arequipa to visit the Church of the Company of Jesus with its impressionable Andean-Baroque-style, as well as its accompanying monastery; young man would enter the church in order to become bishops. Afterwards, we will visit the beautiful Main Plaza with the Arequipa Cathedral that is of a classic style; the interior contains a French pulpit, large Belgian organ, and Italian decoration. We will then continue to the Monastery of Santa Catalina where we will visit the famous colonial structures that were for the women who wanted to convert into monks; this monastery was a miniature city that sheltered Arequipan nuns for more than 400 years. Afterwards, we will head to a beautiful place outside of the city (called Mirador del Barrio Colonial de Yanahura in Spanish) where you will be able to take some breathtaking pictures within the beautiful passage and also of the three volcanos that encompass the region (the volcanos of El Misti, Pichupicchu and Chachani). 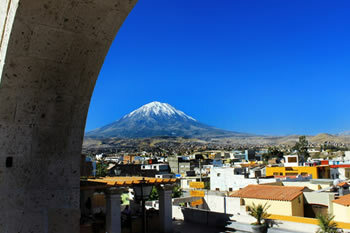 HOTEL IN AREQUIPA: Provides a hotel room with private bathroom + breakfast. Included: Transfer out/in, flight ticket from Lima – Arequipa, City Tour in Arequipa (shared touristic transport, tour guide, entrance fees) + hotel. 08:00-08:45 AM – We will personally pick you up from your hotel in Arequipa to take touristic transportation towards the North of Arequipa, passing through some interesting scenery until arriving to the Cañahuas Grasslands Reserve where we will observe the habitat of vicuñas, alpacas, and llamas (Andean camelids); afterwards, we will continue to a place (Mirador de los Andes) that offers a grand opportunity of taking beautiful pictures of the mountain range. Following Mirador de los Andes, we will then head to what is called Mirador de Chivay where we will be able to admire the pre-Colombian terraces that are still cultivated by the natives of Collaguas. 08:30 AM – We will arrive to the famous Mirador Cruz del Cóndor where we will be able to admire the beauty of the wonderful natural passage that passes through the Canyon of Colca and the majestic flight of the beautiful condors that fly through the canyon; the condor is the largest fantastic bird alive. In this place, we will have time to enjoy the scenery and then afterwards we will return to the village of Chivay. During the trajectory, we will visit another beautiful place (Mirador de Chinina) which is also a typical village of Yanque where we will be able to visit its beautiful church as well pass by the village of Maca. Upon arrival to the village of Chivay, we will eat lunch and then change transportation in order to head to Puno. Once we arrive to Puno, we will find accommodation in the selected hotel. 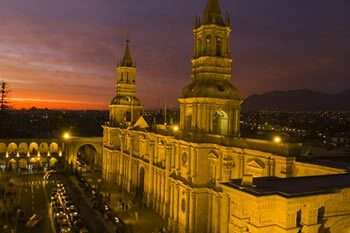 Included: Shared touristic transport, tour guide, lunch, shared bus from Chivay – Puno + hotel. Included: Transfer to the port of Puno, Tour – Floating Islands of the Uros/Island of Taquile (shared touristic boat, tour guide, lunch, entrance fees) + hotel. AM – After breakfast in the hotel, you will have free time on your own account until the hour of our city tour. 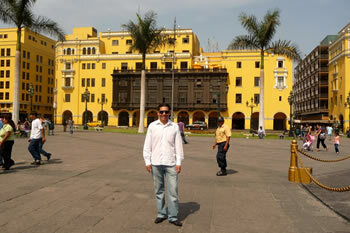 AM – After breakfast in the hotel, and at the indicated hour, you will be transferred to the Cusco airport. AM – Flight from Cusco - Lima; upon arrival, you will be transferred to your selected hotel – then, you will have free time on your own account. 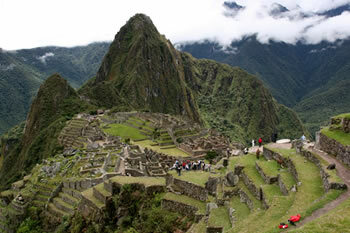 Included: Transfer out/in, flight ticket from Cusco – Lima + hotel.